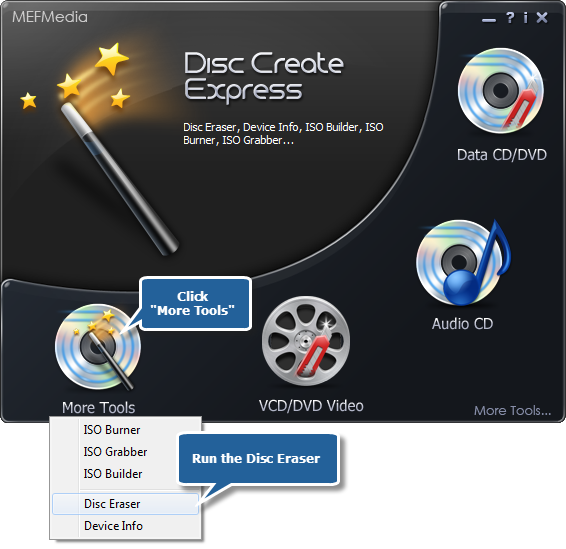 Disc Create Express provides a Disc Eraser tool to permanently erase data from your CD and DVD discs. It is specifically designed to eliminate data that is no longer needed and reuse the discs. Launch Disc Create Express. 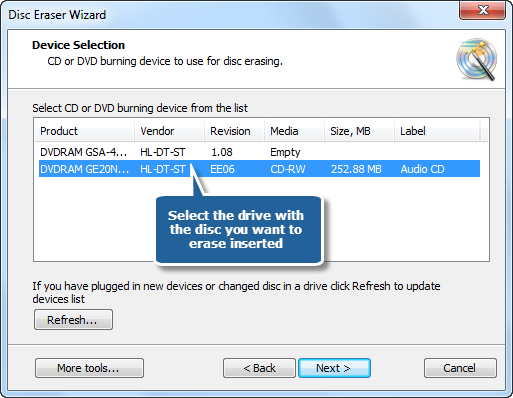 Insert a used CD to the disk drive, click the “More Tools” and choose “Disc Eraser” to run the eraser wizard. The eraser scans your system for the available devices. Choose one of the usable drives from the list to erase disc (the system will select it by default if there is only one). Select one of the erasing types from fast erase (only TOC will be erased) and full erase (whole disc will be erased). The fast erasing, used widely in most situations, will save more time than the full erasing. Choose the suitable erasing speed and start erasing. The disc erasing will be completely finished after the process bar reaches 100%.